On Saturday night I had the great privilege of meeting with eight of the original gang from the youth Bible study I led from 1989 to 1994. A couple of the guys couldn’t make it due to geographical challenges (Perth and New Zealand! ), but for the rest of us it was great to share stories and reflect on the past. It was great to find out where these guys are in their walk with Jesus, and it gives me lots to pray for them, both as a group and individually. Thanks to Ben for hosting the night, and Rob for the tasty dessert… mmm…. Sorry I couldn’t make it – I was in the middle of the desert. Looks like it was a great night! Yeah, it was great, mate. Hopefully when Ben gets back from Mongolia in 3 years’ time we can even more of us together at the same time and place? 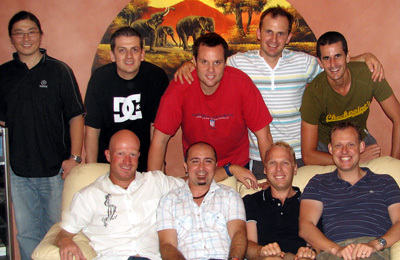 What a great night it was…so positive to see that after all these years all the guys are still following Jesus. The biblestudy has been so encouraging to me even after 12 years. Thank you Jodie for the great leadership through our youth and for keeping us going all these years. You Rock! Thanks for the encouragement, Phil. They were certainly awesome years of growth for all of us… me included! Good to catch up with the guys, and see how we are all maturing (or at least trying to). I shared a bit of info about you all with my class, and the importance of immersing yourself in a solid group of Christian people.